print after you have placed your order. Turbulence was inspired by a photograph. The painting depicts the approaching of dark grey clouds suggesting the arrival of a violent storm. The approaching clouds warn of the upcoming danger. Then you see the orange and yellow hues of sunlight peeking through the dark clouds. This arrival of light tells of the departure of the storm which can be related to our own lives. The most comforting thing about life is that nothing ever stays the same. Things are constantly changing and evolving. We can go through periods that feel like a never ending nightmare, but it does come to an end. There is always calm before and after a storm. The light comes back once the storm is over, and the experiences make us stronger and wiser. If we can get through the most turbulent times imaginable, we can get through anything. We’re never given more than we can handle, and we have the strength and courage to get through it. 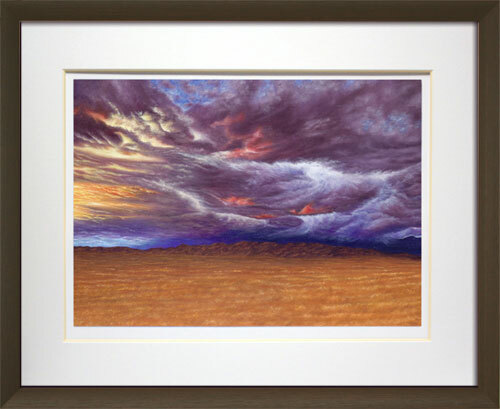 This Signed Limited Edition Giclée print of Turbulence is a print of the original painting "Turbulence". The fine art prints of my paintings allow you to enjoy these artworks without bearing the high price of the original painting. Only 250 prints of Turbulence will be created and are available exclusively here. If you are not fully satisfied with your purchase for any reason, I will refund your money in full. When you order from me, I will make sure that you receive the best service and that you are always kept up to date with the status of your order. After you order by pressing the "Click to Buy" button, you will receive an automatic confirmation message that I received your order. I will contact you shortly after that to confirm your order. For orders outside of the UK, please contact me directly for the shipping cost of your order. Your prints are produced on demand by Synergy Graphics, Birmingham and then mounted by Andy Inston, Fairford Frames, Birmingham. Therefore it may take up to 30 days to deliver your Signed Limited Edition Gicée print. I do not believe in creating unhappy customers. You can step back from the purchase at any time before and up to 30 days after your Signed Limited Edition Giclée print arrives at your doorstep. If you decide to return the print, I will fully refund you and also pay for all the shipping costs for returning the print back to me.